« Do we need any more things? Designers have an important role to play as enablers of the a transition to a sustainable system. As a society, we have the capacity to create systems that will allow us to live within the limits of the earth’s ecosystem. But the necessary changes are not being made – or not fast enough. How might we help design education focus more urgently on the transition to sustainable One Planet Living? 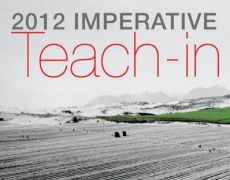 Jody Bohnert conceived and produced 2012 Imperative Teach-In as “a massive social learning project” – based on the example of a similar teach-in, held in 2007 at the New York Academy of Science, that reached a quarter of a million people from 47 countries. The idea was to embed ecological literacy in design education by 2012 – to help students, faculty and staff re-frame design in the context of resource depletion, loss of biodiversity, and climate change. Doors of Perception contributed a speaker and promotional support to the event.